Official Website of Fiji Rugby Union » 5 in a row. Home > Newsroom > 5 in a row. The Fiji Airways Fijian 7s team created history by becoming the first team to win the HSBC World Sevens Series Hong Kong 7s title for the fifth consecutive time. The Gareth-Baber coached side were in top form through-out the tournament overcoming Kenya, Australia, New Zealand, Argentina and USA to reach the final at the So Kon Po Stadium on Sunday night. The Fiji Airways Fijian 7s players were on fire in the final as they defeated a gallant Le Bleu outfit 21- 7 to claim the title at Happy Valley. With the victory, star playmaker Jerry Tuwai achieved a huge personal milestone becoming the first player on the World Rugby Sevens Series circuit to win five consecutive Hong Kong Sevens titles. 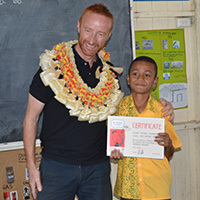 Head Coach Gareth Baber exclaimed there was greaat joy to win the title then dedicated the victory to the victims of the recent Christchurch tragedy. 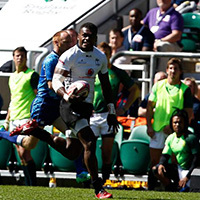 Fiji Airways Fijian 7s speedster Aminiasi Tuimaba was awarded the player of the Final. Tuimaba dedicated his first ever Hong Kong 7s victory to his family. 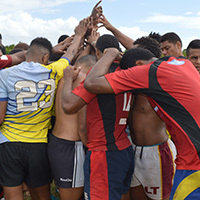 The tournament win boosted the Fijian 7s side to second spot on the HSBC World Rugby Series standing with 123 points, seven points behind leaders USA and 5 points clear of New Zealand. The Fiji side go into defending its Singapore 7s title next weekend where they are pooled with South Africa, Scotland and Canada.